Growing up there was always a tub of beef fat in the kitchen for cooking and frying. Every once in a while Gran would go to the butcher or abattoir and get some muscle fat trimmings that she'd render down in the oven and then use over the next month or two. 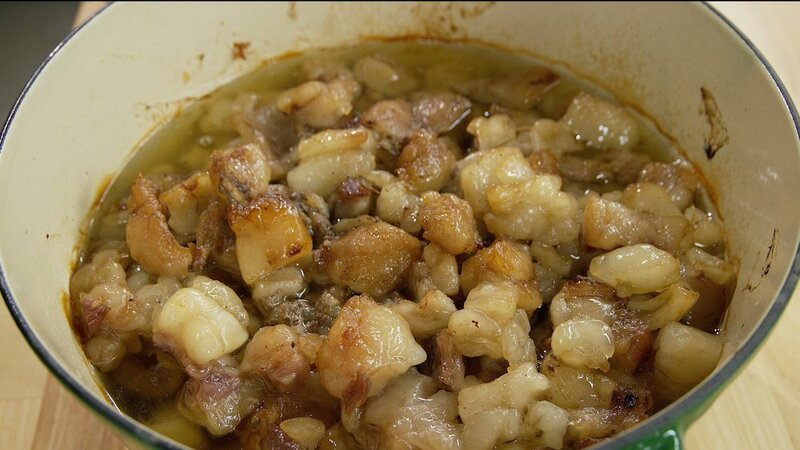 Growing up there was always a tub of beef fat in the kitchen for cooking and frying. Every once in a while Gran would go to the butcher or abattoir and get some muscle fat trimmings that she'd render down in the oven and then use over the next month or two. It was never called Tallow - this was just beef fat. Tallow was made the same way, except she would use 'leaf' or 'organ' or 'internal' fat (same as when she made pork lard). Tallow has a slightly different composition so it's hard at room temperature, and better for soap and candles. What we are making here today is about the consistency of butter at room temperature and is great for frying, deep frying, Yorkshire puddings and other cooking where you need a fat with a deep rich flavour. I just get as much muscle fat as the butcher will give me, trim out most of the muscle that's left in it, and chop it coarsely. No need to grind it fine, or remove every last piece of flesh - you can do those things if you really believe it needs to be done... but I don't, my Grandmother didn't and it's always fantastic. Another piece of advice that most give is to put water in the bottom of the pot - "so it won't burn" - no need for that either... you are setting your oven at 225ºF to 250ºF and beef fat doesn't start to smoke until over 400ºF. So unless your oven is waaaaaaay off there is no real danger of it burning. Adding water just causes problems later because you need to boil it off.